When I tell someone I blog for a living, the above questions are what I am often asked. Most especially since I began a local campaign to help bring awareness to the people in my town about their options to work from home. Unfortunately, I live in a county with one of the highest unemployment rates in the United States. It is hard to watch my hometown fall apart right before my eyes. So, I have made it my personal ministry to help my neighbors. During this time, I have had many looks of suspicion as to why I am doing what I do, and how I make money as a blogger. The people I talk to are being good investigators and making sure to avoid scams! But because they don’t understand how I profit from helping them, they sometimes have initial doubt to my credibility. 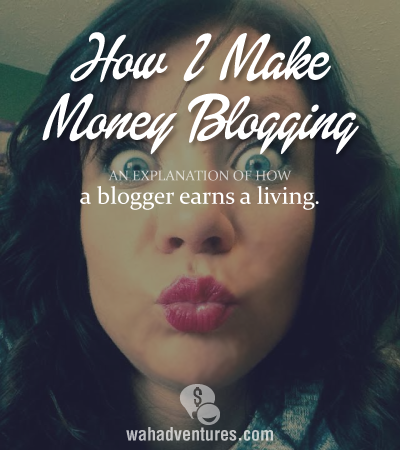 So let me explain how a blogger makes money. Or more specifically, how I make money as a blogger. Advertising is the number one way most bloggers, including myself make money. The common analogy I use when talking to locals is to think of a TV Network. ABC, NBC, CBS Etc…they all make money by providing commercial breaks. The more people they have tuned into their network, the more valuable their advertising becomes. Blogs are the same way. The more people I have visiting and engaging with my blog, the more valuable my advertising space becomes. I have signed up with companies like Google Adsense, Media.net and Infolinks and agreed to display their ads on parts of my blog. However, I try my best to fill my advertising spaces directly with companies I have vetted and know are legit. Rather than letting advertising services like Google fill my ad space with whatever they choose, which may or may not be even related to my articles, I try to sell the space directly to advertisers themselves and cut out the middle man, aka Google. Unfortunately, these opportunities do not fill my ad quota, but it helps keep as much of the advertising on the site helpful and of value to the readers. I have found additional forms of earning money as a blogger by sharing helpful information. For example, I often share work at home job postings I find on the popular career site, Indeed. As an affiliate partner with Indeed, I earn money from the visits people make to the links I share to Indeed jobs. I am also an affiliate partner with companies like Escalate Media, where I share links to some common extra money companies like Reward TV, for example. Sort of like being a recruiter, when people are approved to the companies I share links with, I am paid a small commission. Can You Work From Home as a Blogger? Of course! But don’t expect to start making bank right away. It took me a good 3 years of faithful blogging to begin seeing a significant gain. The end result has proven worth it for myself but not many people are as lucky. As Darren Rowse of ProBlogger.net shared from the results of a survey sent to 1500 bloggers, only 13% of bloggers make $1000 or more a month and 63% of the blogger surveyed earn less than $100 a month. If you need a paycheck now, focus first on finding a legit work at home job that offers you a steady pay. Read over this getting started working from home guide. Then, you can begin your blog on the side, in your spare time. If you keep it up and have something of interest to enough people, you can one day quit your day job! If making money isn’t a priority for you right now, then get started blogging now and use this valuable time to create a passive income for your future! I don’t have a guide to getting your blog started, but there are plenty around the web and eBooks on Amazon. If you need someone to hold your hand, you won’t succeed, you CAN teach yourself! I would like to know if building a website and blogging can both earn you money and have the same effect? I can easily start blogging thanks to Google but I wondered if it would have the same results. Thanks for these tips. I am also want to know the easy way to build my website, now i am got some information but want to know more about blogging tips. Ones again thanks for sharing this topic. I am waiting for your next post. For a long time, I was under the impression that writing jobs were hard to come by; then, I figured out that corporate training requires training manuals and instruction. True. Is that how you make money? Do you write training manuals?